To err is human, but to err deliberately, to literally make a comedy of errors, is farce. 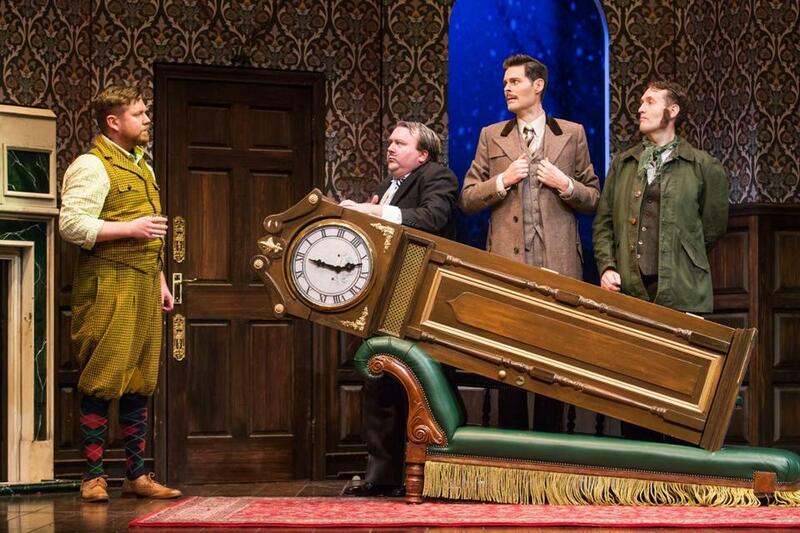 However, that kind of theoretical resistance dissolves when you’re immersed in the delightfully deranged alternate universe of “The Play That Goes Wrong,’’ a farce whose title is the only understated thing about it. Winner of the 2015 Olivier Award for Best New Comedy, it’s been running on Broadway for more than a year and a half. Now a touring production has set up shop at the sumptuously restored Emerson Colonial Theatre, and within those ornate confines, the show’s marvelously skilled cast constructs layer upon layer of inspired absurdity, even as the onstage set is literally collapsing around their ears. Alas, it is not to be. Not only do their ambitions exceed their talents, but their production turns into a case of Murphy’s Law run amok. At every turn the actors are beset by colossal technical difficulties that encompass everything short of the biblical plague of locusts — and you half-expect the locusts to show up at the curtain call. As matters go wildly awry and the troupe frenetically struggles to keep the story going and the production afloat, much of the fun for us in the audience stems from their increasingly fruitless efforts to maintain a stiff-upper-lipped sangfroid amid the spiraling chaos. In its cockeyed way, “The Play That Goes Wrong’’ is likely to make you more fully appreciate the next, mishap-free play that you see, so rife is it with reminders of all the things that have to go right in any stage production, all the interlocking puzzle pieces. But director Matt DiCarlo and writers Henry Lewis, Jonathan Sayer, and Henry Shields also have a high old time spoofing the inherent artificiality of theater, delivering sendups-to-savor of sundry theatrical devices, conventions, tropes, and types. The types on hand include the incurable ham, forever breaking character and flashing a smile as he plays to the crowd; the vain diva who alternates between swanning across the stage and swooning upon it; the supporting actor who can neither remember nor pronounce his lines; the sharp-elbowed substitute who ruthlessly seizes her chance, “All About Eve’’-style, to usurp a star; and the surly technician who would rather be doing just about anything else and often is. It all begins when Charles Haversham (Yaegel T. Welch) is found dead at his own engagement party (though Charles is a curiously mobile corpse). Was it suicide, or was it . . . murder? If the latter, did his sultry fiancee, Florence (Jamie Ann Romero), have a hand in it, perhaps in collaboration with Charles’s brother, Cecil (Ned Noyes), with whom Florence has secretly been having a torrid affair? Or might it be Florence’s brother, Thomas (Peyton Crim)? Or is this yet another case where the butler — in this case, the stolid Perkins (Scott Cote) — did it? Along the way, there will be pratfalls, onstage squabbles, and spit-takes galore. Doors won’t open. Set pieces will fall. (In this show, inanimate objects have a malevolent mind of their own.) Cues will be missed. Script pages will litter the stage. Lines will be mangled or declaimed in the wrong order. Stage directions will inadvertently be recited as part of dialogue. Scenes will be improvised. Kisses will be sought and rebuffed. A couple of performers will be knocked out cold. There is more, much more, as revelation follows revelation in this delirious meta-mess, all of it executed by the cast with spot-on timing and comic zest. By the end, you’ll almost certainly have surrendered to the screwy logic of farce, or at least to “The Play That Goes Wrong.’’ No need for the words zany or madcap to spoil the fun, but there’s another cliche that fits: Let’s just say it’s a crowd-pleaser in the best sense.